Police resistance to a full-service commitment in domestic disputes comes from three main sources: a) job-related beliefs, values, and atti­tudes of police officers; b) bureaucratic-managerial resistances within the force; c) general societal beliefs, values, and attitudes. In establishing a new training program for police officers in domestic conflict manage­ment, special attention must be paid to changing (a) and (b) and at least making officers aware of (c). 2)	Such calls often involve emotionally upset people, which many officers find discomfiting and somewhat embarrassing, especially when personal emotional material is used as a weapon in a verbal dispute between intimates. 3) In many cases, the dispute strikes the officer, either consciously or not, as being similar to a personal dispute he may have had or be having with his own spouse. To the extent that the similarity is not conscious, it can create problems for the officer both in his inability to maintain neutrality in the present dispute and in the aggravation of his own domestic problem. 4) Untrained officers have no feelings of control in family disputes. Their only perceived control in the situation is the use of authority and toughness, but this often backfires, leading to violence that is touched off by the officers own behavior (Bard, 1971). In other words, the rules that work for the officer in the street often backfire in a family dispute, and, if untrained, the officer has not yet learned a new set of workable rules or alternative sources of control in a situation. 5) Untrained officers have no feelings of accomplishment in family disputes. Improperly handled disputes lead to high recidivism rates. When police are called back to the same address time after time, a feeling of futility sets in. While some of these families may be locked into a chronic fight pattern, many others can be dealt with more successfully by trained police. In addition, many departments try to change policy on family dispute handling through training alone, without an accompanying change in the departmental reward system, so that correct application by the officer of the proper intervention procedures goes unrecognized and unrewarded. Police department reward criteria continue to support the traditional police role. The end result may be that training effects are lost. 6) Effective family dispute intervention requires some interpersonal sensitivity and verbal skills, both of which traditional police avoid. Yet no one could argue that a police officers general performance on the job would not improve through the acquisition of either skill. 7) Police feel that laying of charges in a family assault is futile because the injured party (usually the woman) will not carry through on the charges after the crisis has passed. Yet alternative means of clearing the call are, by some twist of logic, similarly resisted. Police gripes about the lack of achievement they feel handling domestic disputes have some basis in departmental policies, rewards, etc. ; yet these gripes are often not heard about similarly unrewarding parts of the more traditional police role, leading one to infer that they are in part a resistance to role change per se. 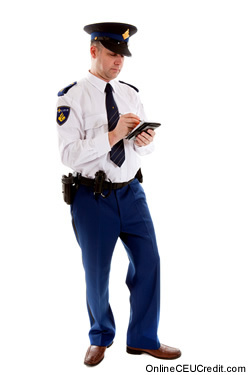 8) Probably no other aspect of police work straddles the tightrope between police law enforcement responses (if an assault is occurring police are expected to act with dispatch, power and authority) and order maintenance (in a delicate emotional crisis police are expected to be wise, good at communicating, and capable of effecting a resolution). To an extent, these two responses are somewhat antagonistic and incompatible. Consequently, a police officer answering a family dispute call is put in a sort of double bind situation: He can make a mistake by going too far in either direction (if too tough, he can trigger violence; if too soft, he can fail to contain it). Often police officers enter a family dispute situation without knowing which response will be required of them. This tightrope situation contributes; greatly to the tension the officer feels in such situations. The training procedures described below attempt to remedy this dilemma by teaching police how to maximize their information about a dispute in progress prior to entry (Dutton, 1977). The net effect of the points above is to create in the untrained officer a feeling of anxiety, lack of control, unease, and futility in handling family dispute calls. Each and every training session must deal openly with all of these resistances, as well as with any others that officers volunteer in an open forum type of atmosphere. Failure to do so simply leads to officers keeping their negative feelings to themselves but I passively resisting the skills, insights, and perspectives offered in the training workshop. - Stuart, Richard B., Violent Behavior: Social Learning Approaches to Prediction, Management, and Treatment, Brunner/Mazel Publishers: New York, 1981. The preceding section contained information about police resistance with family dispute calls. Write three case study examples regarding how you might use the content of this section in your practice. What is a double-bind situation a police officer answering a family domestic call faces? Record the letter of the correct answer the CEU Answer Booklet. What are three main sources that police resist to a full-service commitment in domestic disputes? Record the letter of the correct answer the CEU Answer Booklet.